In one of the most bizarre wildlife stories of the year, last year about 200,000 saiga antelopes dropped dead in a month on the high plains of Kazakhstan. 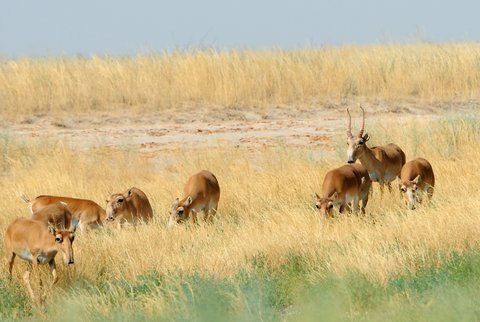 The die-off was so significant that it accounted for 88 percent of the antelope in that region and 70 percent of the world population of this already endangered species of antelope. Lots of theories emerged in the months following the news, including mortal bloat or an infectious disease. Some even thought it was from rocket fuel, according to The Guardian. But now the Saiga Conservation Alliance has released a report naming a bacterial infection as the cause. Confirmed by several labs, tissue samples found the bacteria Pasteurella multocida, which normally lives harmlessly in the respiratory tract of animals. The bacteria has been known to show up in domestic animals but not to these degree. Somehow it’s believed the bacteria morphed into something extremely harmful, resulting in high fever, salivation, and shortness of breath followed by death in less than 24 hours. But they are still not sure exactly how it was able to take over on such a massive scale. Never before has an incident like this been documented.